Carole Marsh Mysteries, 9780635020994, 146pp. Four real kids on a visit to New York City get gridlocked in a mystery that takes them on a wild hair-raising tour of the Big Apple's famous landmarks to find a priceless piece of history--but only they know it's missing Renaissance Learning, Inc now has Accelerated Reader quizzes for all of the Carole Marsh Mysteries To visit their website, click here. 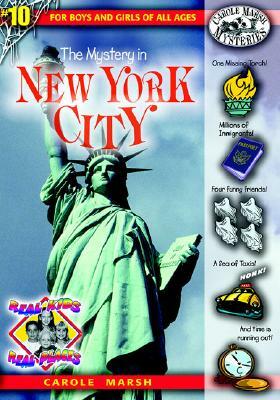 The Mystery in New York City is recommended by Sylvan Learning's Book Adventure reading program. Book Adventure is a FREE reading motivation program for children in grades K-8. Sylvan Learning is the leading provider of tutoring and supplemental education services to students of all ages. Each mystery incorporates history, geography, culture and cliffhanger chapters that keep kids begging for more Each mystery includes SAT words, educational facts, fun and humor, built-in book club and activities. Each Carole Marsh Mystery also has an Accelerated Reader quiz, a Lexile Level, and a Fountas & Pinnell guided reading level.